Four years ago, Donald Trump averaged a 30/56% favorability rating across twenty state and national polls taken from the start of 2011 until he officially withdrew his name from consideration on May 16. That's a net nine points higher than his average favorability rating thus far this year. 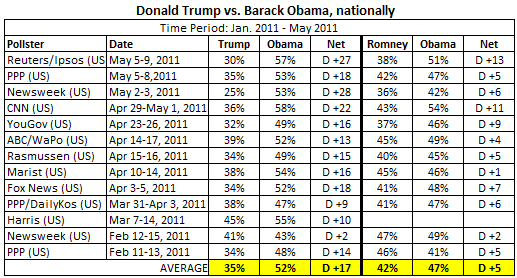 Among national polls alone, Trump averaged a 32/53% favorability score in 2011, a net 19 points higher than his current year-to-date average. And like we're seeing this cycle, Trump's favorability rating was underwater in every state and national poll taken in 2011. It isn't just the overall American electorate that views Mr. Trump in a negative light - members of his own party aren't terribly accepting either. Of the nine state and national polls conducted since his official campaign launch, The Donald only breaks even among Republican primary voters, with 43% viewing him favorably, and 43% viewing him unfavorably. That number drops to 35/51% when considering all twenty-three state and national surveys conducted this year, of which Trump is above water in only three! 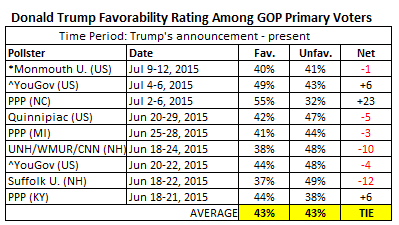 Besides perhaps Chris Christie, those are the worst ratings of any GOP candidate with widespread name recognition. * indicates the survey population is of Registered Republicans and Republican-leaning Independents. ^ indicates the survey population is of Republican adults. It was a similar story four years ago. Against an array of big-names like Mitt Romney, Mike Huckabee, Sarah Palin, and Newt Gingrich, Trump was by far the most disliked among the Republican base. Just 40% said they viewed Donald Trump favorably across twenty-one state and national polls taken in 2011, while 45% said they did not (a net eleven points higher than the 35/51% he has averaged in 2015). 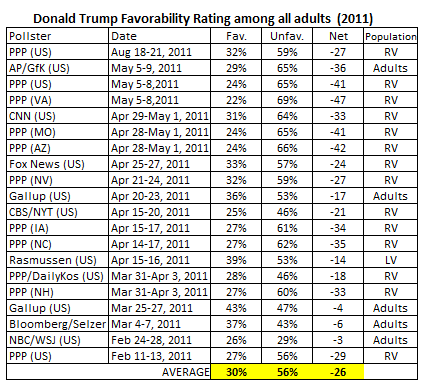 Of those twenty-one polls, Trump's favorability rating was in the net positive range in less than half. Again, this is among voters in his own party. * indicates survey population is of registered Republicans. ** indicates survey population is of Republican adults. ^ indicates survey sample is of Republican likely voters. One final aspect in which Donald Trump looks weaker in polling than in 2011 is his standing in the general election against Hillary Clinton. Across seven state and national polls this year, Clinton attracts an average of 50% to Trump's 37%. When looking exclusively at the four national surveys taken this year, his deficit grows to 52-34%. In the same four polls, the largely unknown Marco Rubio averages eleven net points more against Clinton than the universally known Trump, trailing just 48-41%. Mr. Trump's support is also surprisingly subpar, once again, among Republicans. In the four national polls to test a hypothetical Clinton vs. Trump race this year, Trump averages a 68-14% lead among members of his own party. Sound impressive? Not compared to Jeb Bush, Scott Walker, or Marco Rubio, all three of which earn over 80% support from Republicans in the same four national surveys. Trump is also especially toxic in the eyes of Independent voters, who give Hillary an average 49-32% lead in national polling. Marco Rubio, by comparison, trails Clinton just 41-39% with this group. Trump's general election prospects looked only slightly better in the Spring of 2011, though not by much. At a time when Obama was barely treading water in terms of his job approval rating, Trump averaged just 36% to Obama's 51% across twenty-three state and national polls taken from January-May, 2011. In national polling alone, Trump fared nearly as bad as he is today against Clinton, trailing the President 52-35%. 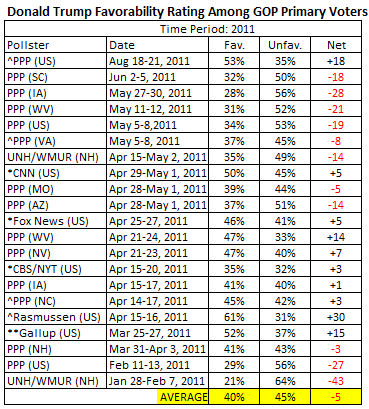 Compare that to eventual nominee Mitt Romney's poll performance against Barack Obama in national polling during the same time period, in which Romney trailed by an average of just five points. And like today, Trump could barely get out of the 60s among Republican voters against the President they so loathed, and failed to resonate with Independents. In spite of the brutal polling reality faced by Trump discussed above, his dedicated group of supporters can at least look to one thing for hope - the GOP primary horse race, where Trump has raced to the top of a pack of fifteen candidates, with at least one more likely to join. He averages 12%, second to only Jeb's Bush's 14%, across eight national surveys conducted among primary voters since Trump's official entry in the race. * Indicates survey population is of Republicans and Republican-leaning Independents. ** Indicates survey population is of registered Republicans. ^ Indicates survey population is of Republican adults. ^^ Indicates survey population is of registered Republicans and registered Republican-leaning Independents. ^^ Indicates survey population is of Republican and Independent adults. But a little perspective is required before assuming Trump's present surge will last. As noted in the tables above, the former host of The Apprentice rocketed to the top of primary polling four years ago, only to fizzle fast. Openly questioning the President's American citizenship, a blustery, profanity-laced speech in Las Vegas, and the sudden killing of Osama Bin Laden all led to a quick collapse among Republican primary voters. 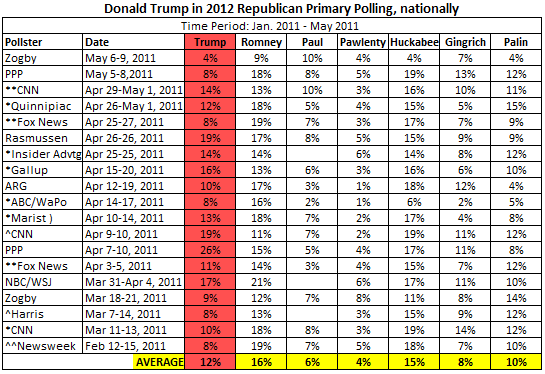 Consider that in the month of April 2011, Trump averaged 13% of the Republican primary vote in state and national polling. In May 2011, before ruling against a bid in the middle of the month, he averaged only 7%. Further limiting Trump's appeal are abnormally unfavorable views from his own party, as well as near universal name recognition - a combination that allows very little room for growth. In every survey to ask Republicans which presidential candidate they would not consider supporting in 2016, or some variation of the question, Trump ranks at the top of the list. A recent poll found 43% of Republicans would be dissatisfied if Trump were to become the GOP nominee. Another new poll found 39% of primary voters believe his presidential bid is more of a publicity stunt than a serious run for office, by far more than any other candidate. Fox News found that by a 64-29% margin, registered Republicans view Trump as a "side show" rather than a "serious presidential candidate." That sentiment was shared by 77% of all registered voters! Trump is certainly allowed to exaggerate his stature among Republicans and the American electorate in general all he wants. 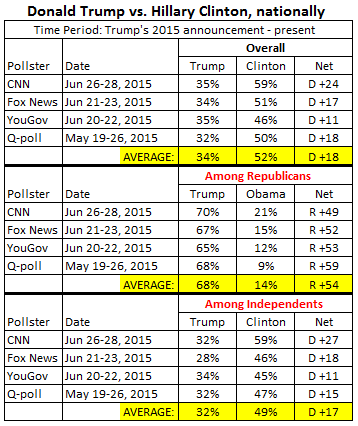 But the fact of the matter is that Trump's perpetually low favorability ratings, as well as his anemic general election standing, make it likely that we're fast approaching "peak Trump" in Republican primary polling - that is, if we haven't already reached it.